My stay at Udavi School began at the end of September 2012 and lasted until the 18th of January 2013. 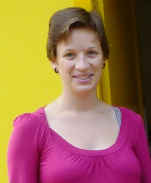 I am Sarah Berres, a 23-years old woman from Germany who stayed and worked at Udavi for almost 4 months. I was part of the everyday school life and worked Mondays to Fridays from 8.30 a.m. to 2.30 p.m. in the kindergarten section (L.K.G, U.K.G, I, II, and III. standard) and once a week in 8th standard. Working at Udavi was a wonderful experience and I appreciate being with the kindergarten section so much. I just finished my bachelor degree of education for the highest school level, which means for older pupils, so working with pretty young kids was a new field of education for me. Actually, it was a greater challenge in the beginning to make myself understood as the smaller kids’ English is limited and my Tamil is inexistent. But the more I got to know the children and they got used to my English, the more we could share. Talking to the teachers was pretty easy, as their English is good and they warmly welcomed me. During my stay they taught me a lot about Tamil Culture, religious festivals and shared their experiences with the children with me. Gratefully, they let me integrate my own ideas and suggestions about projects or tutorials for slower learners in the lessons’ context. That is why I practiced the English language in reading, writing and speaking, as well as I did mathematics, environmental studies, social studies and games lessons with the pupils. I was assisting the teachers during their classes, planning further lessons with them, attending the school-trips or teaching a class alone when the regular teacher was absent. Working in smaller groups gave me the chance to get into closer contact with the kids and to work out my own style of teaching. In groups of 4 to 5 pupils we created and designed animal masks together in second standard where the topic was animals. In the first standard we created a whole book on fruits and vegetables, where the kids drew the fruit first and in the following page wrote sentences about it. I was really touched by seeing the pupils proudly showing all the craft works, paper sheets, books, pottery, posters and drawings to their parents on exhibition day. They were so excited and happy and the parents took a great interest in their children’s work. Some teachers told me later on that the parents were also impressed by their children talking with me in English. It was a lovely experience to see the pupils and teachers being proud of their work and to really take part in the happenings in school. What I would love to see more of is the pupils supporting and helping each other and to strengthen the awareness of being one group that belongs together. They were often complaining about others or dealing with conflicts physically, which in my opinion deconstructs their feeling of unity. So when I saw them in discussion about a problem or helping each other, I always encouraged them to keep this loving attitude which shows respect and empathy. 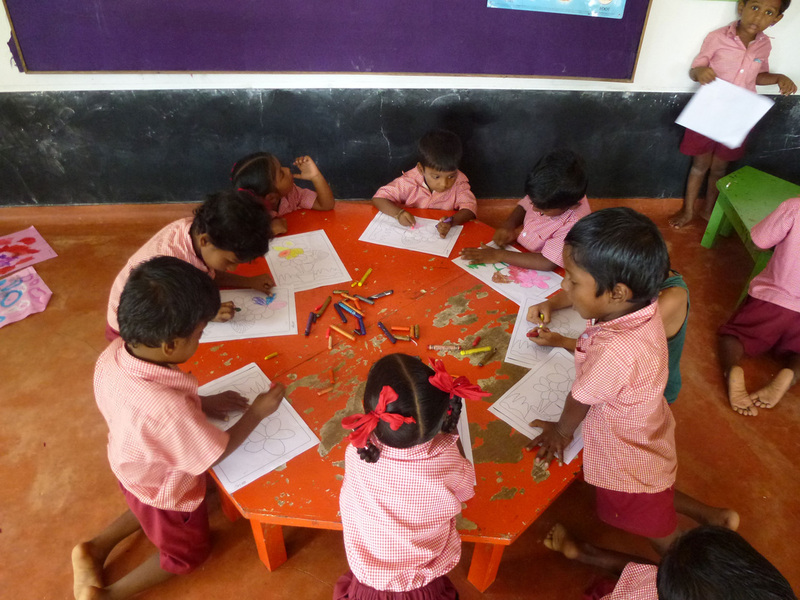 After the pupils realized that I don’t understand them speaking Tamil, they tried really hard to express themselves in English and improved a lot. It didn’t seem to bother neither them nor me to sometimes repeat things several times in the beginning. When we finally understood each other, we both were happy and satisfied. The kids were also very patient with me while teaching me their songs or games, like “cooking Dosais” or clapping games. 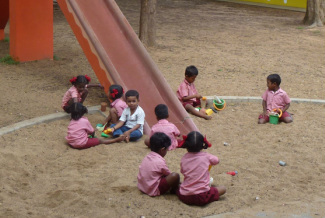 We had a lot of fun together and the children accepted me as their teacher when we were alone in class, too. Over all, I thank the teachers for welcoming, integrating me so kindly and for giving me the chance to help and be part of every class in the kindergarten. It was important and interesting to see different styles of teaching, different teachers with various backgrounds and to overlook the pupils’ levels of English and other skills in their first years at Udavi! I thank everyone who made my stay at Udavi possible, the teachers with whom I worked and the pupils who were so grateful and lovely. I enjoyed being here a lot as the contact between all the teachers are friendly and open and the general atmosphere at Udavi is welcoming and joyful.